I am a big fan of creepy stories. No, I’m not into Stephen King or Dean Koontz or their choleric forerunners: Lovecraft and (alas often) Poe among them. I will take M.R. James though, even though he sits uneasily on the fence between baroque excess and darker understatement. But how not to love “Oh Whistle and I’ll Come to You, My Lad”? I’ll take Stoker too (yes, yes, Dracula, but read The Squaw). Among my all-time favorites, however, are the more nuanced but nevertheless not unusual suspects; say Ambrose Bierce’s "The Boarded Window," W.W. Jacobs’s "The Monkey’s Paw," H.H. Munro’s "Shredni Vashtar," or that great eerie masterpiece by Henry James, The Turn of the Screw. I’ll also take The Little Stranger, a chilling novel by Sarah Waters. So it was with interest that I recently picked up a reissue of Robert Aickman’s oddly described “strange stories,” this one a collection called Cold Hand in Mine. I liked the description “strange stories.” I loved the title of the collection. I was intrigued by Neil Gaiman’s blurb on the cover: “Reading Robert Aickman is like watching a magician work, and very often I'm not even sure what the trick was. All I know is that he did it beautifully.” And to top it all off, I was coming to Calcutta, which along with London is one of the two best places in the world for reading “strange stories.” After all, it was in Calcutta that I was introduced to the bhuter golpo or ghost story — and both British colonial and “indigenous” versions (especially the kind located in railway stations or run-down mansions just outside Calcutta) still give me a most delicious case of the creeps. Aickman was an interesting guy. He was a founder of the Inland Waterways Association, which oversaw the rejuvenation of the inland canal system in England. You can read more about him here. I had heard of him because he had edited the first eight volumes of the Fontana Book of Great Ghost Stories. His stories have been largely out of print, and now they have been reissued. So there I was, reading Aickman, and I was hooked. Delightfully creepy and yes, decidedly strange. I was so happy that I logged into my Amazon account and bought a Kindle version of The Wine-Dark Sea, another collection of his stories. Aickman clearly had fun writing these, I thought, as I most happily careened from one strange story to another. I put up a Facebook link to Cold Hand in Mine, and continued to read. All the stories are perfectly readable, most are truly downright weird, and some of the weird ones are really excellent. Then I ran into "The Hospice." I read it at 1 am a couple of nights ago. Last night I woke up at 3 in the morning and read it again. Then I pretended to go back to sleep, but whom was I kidding? Here’s how I felt reading Hospice. Imagine crouching on the floor in a corner before an unchained Doberman. You can hear it growl, but you cannot see it; you are blindfolded. You are forced to caress its silken flanks as you wait and flinch, flinch and wait. (My irate dog-lover friends, you can substitute the furry weight of a tarantula placed in your open palm, its legs sliding through your fingers.) If some equivalent of these images does not come to you as you read Hospice, I will eat the only hat I have. Not that there are any tarantulas or Dobermans to be seen in Hospice. It’s just that a man named Maybury happens to be lost, driving home from his office somewhere in the West Midlands. Something feral bites him in the leg as he gets out to ineptly look for directions in the growing dusk. He gets back in, drives on, sees a sign for the Hospice, with its promise of “good food and some accommodation.” So far —- except possibly for that bite — it could the start of a million horror stories. But the dread here comes a-creeping, (always) namelessly and (for a while) quite soundlessly, but above all strangely. In fact, the two closest connections I feel to Hospice have nothing directly to do with the horror genre. The first is almost a methodological connection to surrealist painting, perhaps one of those day-night canvases that so unnerve you, by Magritte. Or perhaps it’s something waiting to happen behind one of the distant arches in a Di Chirico painting. 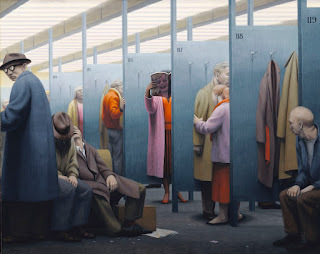 It reminds me most of all of The Waiting Room, by George Tooker. There is a backward loop here again to the short story: Tooker's work features on the cover of Alberto Manguel’s wonderful edited collection, Black Water. Ah, but what befalls our protagonist, the somewhat irritable and slightly apprehensive Maybury? Nothing really, to begin with. He enters the hospice, and settles down for dinner. There appears to be great interest in feeding the guests very well. The main course is an “enormous pile” of turkey, “steaming slightly, and also seeping slightly with a colourless, oily fluid.” ("Ew!" says my niece Rohini.) He does observe, quite inadvertently, that the other guests appeared to be “one and all eating as if their lives depended on it.” And then, of course, Maybury must stay the night. It will be a strange night. The horror short story genre notwithstanding, The Hospice perhaps best brings to mind the great British horror film Dead of Night. Like Hospice, Dead of Night invokes the growing nightmare of being shut up in a weird house with odd people. But the resemblance ends there. The sheer subliminal horror of Hospice shares neither the ornate excesses of Dead of Night nor the slick recursion of its ending. (That magnificently self-referential ending, as it so happens, inspired a theory of the universe). Along with its protagonist, the story will let you off, disheveled, scared and out of breath, on an eerily familiar street under a grey sky, wondering just how you got there and with the feeling of half-awake relief that a nightmare has just ended. Or has it. Robert Aickman, "The Hospice," in Cold Hand in Mine, reissued 2014.